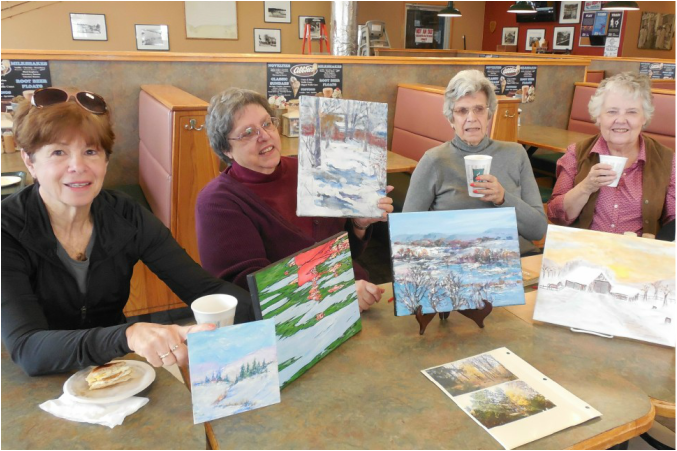 Artists and artists-to-be are invited to meet weekly for breakfast and informal discussion at Bill Gray's in Seabreeze (Irondequoit), every Thursday at 10:30 AM. The purpose of this gathering is to talk about art, exchange ideas, socialize, share information (such as useful websites), show works in progress (you may bring them), discuss current art topics, recent projects, good reads, etc. There are no dues. You need not be a member of any club or group. Numbers of attendees usually range from 5 to a dozen persons. All artists of any media are invited. No need to purchase food or coffee to participate. For those wishing to purchase food or beverage, there are coupons in the local phone book and newspaper. Senior discounts are also available. The contact person is Irondequoit Art Club member, Terry Patti, 342-2279.